In this article, we are going to demonstrate a 900Mhz feedforward amplifier design. Feedforward is a linearization technique for the IM distortion, caused by the nonlinear feature of the active device. Lateral interference, generated by the IM distortion on both sides of the main frequency, affecting the Adjacent Channel. Decreasing this interference is the purpose of this entry. operates at 8 V in common source mode at frequencies of up to 1 GHz. POUT is 31dBm (IDQ=50mA) and Drain Efficiency, 60%. Once we have designed the amplifier, we’ll make the linearization of the IM products, using the feedforward technique. 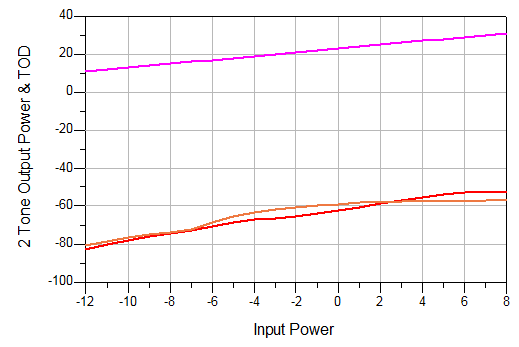 Amplifier’s gain is 34,3dB, and its phase is 76,4deg. 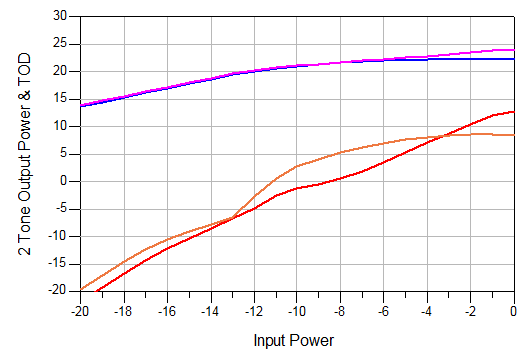 Input and Output Return Losses are respectively 30,7 and 39,8dB. Then, the amplifier is matched and the maximum power at 900MHz is 27dBm, for 1-Tone. For a 2-Tone input, the IM distortion generates a power drop, caused by the Third Order Distortion. TOI (Third Order Intercept) is 31,7dBm, near of the maximum output power of the datasheet, and it causes the power drop. Intermodulation products are 12dB below the carrier, and this value may cause interference on the Adjacent Channel. Therefore, we must reduce this value as much as possible, using a linearization technique. There are many linearization techniques, but we are going to use the feedforward technique, because it is a technique that requires only the use of RF networks. Where the input signal Pi is a 2-Tone signal. In this case, we will not take into consideration the second order distortion, since the Pi frequencies will be very close together. A bandpass filter could remove the second order spurious. These coefficients are going to use to calculate the phase shifter of the first stage. Now, we shall describe shortly the feedforward technique. The Feedfordward Principle is based on reducing the distortion by mixing in phase opposition with the same distortion. In a RF amplifier, an output distorted signal is generated due to the active device’s nonlinearity. It could be mixed with the input signal in phase opposition, adjusting the levels of both signals. So, we get the distorted signal on one port, and on the other port, only the distortion spurious. Cancellation of the main signals on the second port is achieved by placing a delay line (τ1), in the secondary network of the first stage. One sample of the signal output of the amplifier (G1) is derived to combine with the secondary network, with a combiner. The levels of both signals are equalized by an inter-stage attenuator (β). Then, both signals are combined. Then, the ouput signal of the amplifier is called MAIN, and the combined signal, AUX. AUX is now used as an error signal in the second stage, which is amplified by an error amplifier (G2), while the MAIN is delayed with another delay line (τ2). In this second stage, we want to get the same effect than the first stage: put both signals in phase opposition, and combine them. Then, the distortion is cancelled and reduced the interference on the Adjacent Channel. θ1 is the phase of the linear gain of the amplifier. Then, not only the phases must be in phase opposition, but also the delay time must be the same in every subnetworks. In magnitude, it must be satisfied |β·g1|=1. In the second stage, the gain of the amplifier must equalize the g2 and g3 levels, and their phases must satisfy the same equations (absolute phase and delay time) of the first stage, to combine and cancel the distortions. In a narrowband amplifier, delay time could not be considered, because its phase slope will be smallest than the phase slope of a broadband amplifier. Now, we are going to design our feedforward amplifier, based in our two-stage LDMOS amplifier. In first, we must split the input signal in two outputs, one to the amplifier and the other to the phase shifter. We are going to use an 180-deg hybrid coupler, with 3dB of insertion losses. At this frequencies, hybrid couplers could be easily found in the market, as a Surface Mounting Device (SMD). The designed amplifier is a narrowband amplifier. The output levels of the hybrid coupler are the same, in magnitude and phase. The phase of the amplifier gain was 76,4deg in linear mode, but in nonlinear mode, we have got a phase of 69,4deg, with 0dBm of input power. Taking a sample of the output level of the amplifier with a directional coupler, which introduces a 90deg coupling phase, with 10dB of coupling level, we have got a sample level of 12dBm, with a phase of 159,4deg. Then, we are going to combine with another hybrid coupler, and as in the secondary network the level is -6dBm, we have to equalize both levels with the attenuator, whose attenuation must be ≈20dB. The phase shifter should be adjusted to a phase of ≈-12 deg. Adjusting the phase and the level with the phase shifter and the attenuator, we are able to optimize the response for several input levels. We are going to complete now the second stage amplifier, where an error amplifier increases the level of AUX spurious intermodulation to combine in phase opposition with the MAIN line. The error amplifier G2 should not be a power amplifier, at this stage. 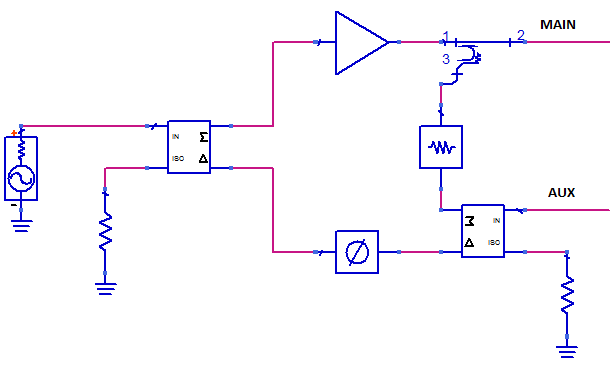 A linear, general-purpose amplifier maybe used. The gain is calculated by the difference between the MAIN and AUX IM spurious. This value is 45,5dB, because we are combining with a directional coupler, to reduce the insertion losses in the MAIN line. 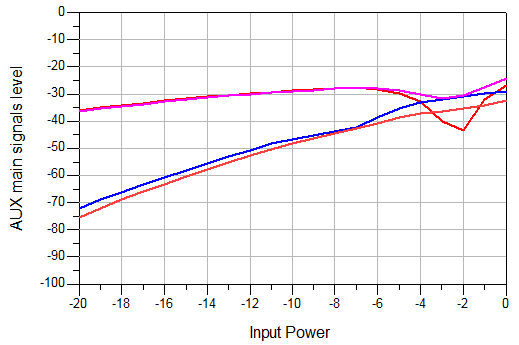 Using an amplifier with a magnitude of 45,5dB and a phase of -145deg, we have got a phase shifter with the same value, and after the coupler, the IM distortion decreases around 65dB. The output level is now 31dBm, and the TOI increases to 75dBm. With the amplifier designed we have achieved a significant improvement: increasing efficiency around 40dB for the same output level, on adjacent channel. Furthermore, the amplifier is very simple to realize with a few RF devices. The design is very easy and intuitive. However, the Feedforward has two serious disadvantages: on the PCB, it needs a lot of surface; and the input level cannot be increased above the input level that provides maximum output level of the MOSFET, because the distortion can be increased above the value we have corrected. In broadband we must take into consideration not only the phase of the amplifiers but also the group delay, because the phase slope of the amplifiers has to be compensated by the phase shifter. Then, the phase shifter could have a larger surface dimensions, because it must be a delay line, too. Esta entrada se publicó en Analysis, Circuits, Design, Feedforward, Radiofrequency, Simulation, Theory y está etiquetada con circuits, design, electronics, radiofrequency, simulation, systems, telecommunications, theory en diciembre 27, 2014 por Tomás Rosich.